Technically I just got back from the Origins Game Fair today, since I didn't get home until after midnight this AM. After way too little sleep due to overly gracious pets I've managed to get most things unpacked and some things put away, but I wanted to get some version of a Con Report on the blog today. Normally Mrs. FrugalGM and I come in to Columbus on Tuesday, which is great because there is next to no line and you can get in some early Wednesday gaming. This time our schedules only allowed a Wednesday arrival and we didn't have our badges already so we did some line waiting. Nothing too painful. One thing I love about Origins over any other convention I've been to is the food. I'm sure the actual convention center food isn't worth talking about, but one block from the convention center is the North Market, and awesome place to eat. Within another block are a number of quality restaurants. 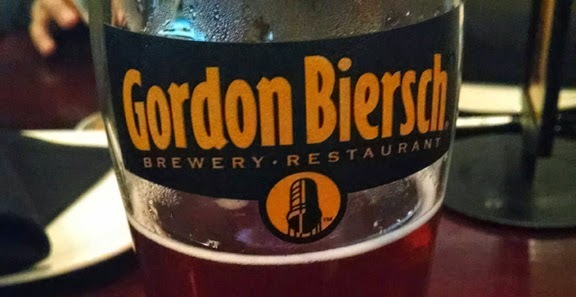 One of my favorites is Gordon Biersch. As a general rule, my gaming group prefers beers I don't want to touch, namely bitter, hoppy IPAs. Since I'm in the NW where we grow a lot of hops, that style is predominate around here. I saw it is just a lazy & quick way to make beer. Give me a good lager, preferably a Märtzen. If I'm lucky I can get it once a year, unless I get to a Gordon Biersch, which keeps a great Märtzen on tap. 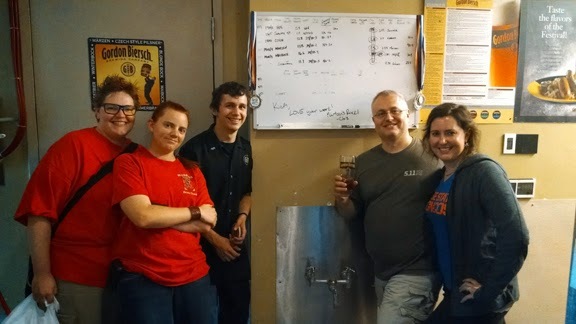 Our server was great, gave us a quick brewery tour, and made sure to appropriately mark the IPA growler that wasn't mine. 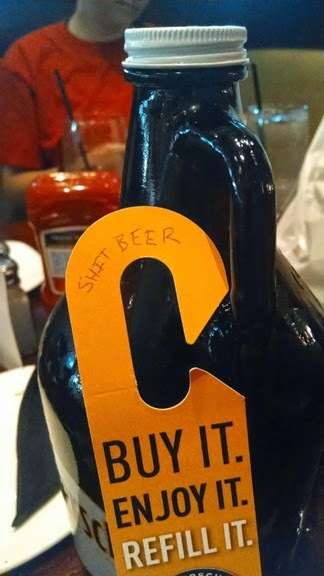 Now, I know that Origins is not even remotely about beer, but as far as I was concerned, the con was already a success! 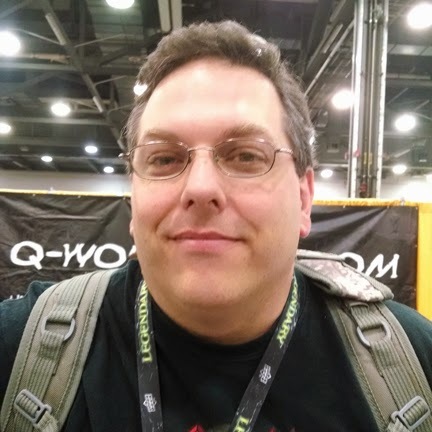 I had a HackMaster game to get to pretty much every morning at 9 and kept my afternoons open for traversing the dealer hall and my evenings free for friends and more HackMaster. I was told that the KenzerCo HackPack was to have an entire room to ourselves for gaming, but that room was essentially double-booked for every table. A lot of games, too many, didn't get run because of too many no-shows. Evidently the convention book did a poor job of listing games. Events were categorized by type (miniatures, RPGS, LARPS, etc), but the listings themselves didn't have some basic & essential information, like what game system was being run. I found 1(!) 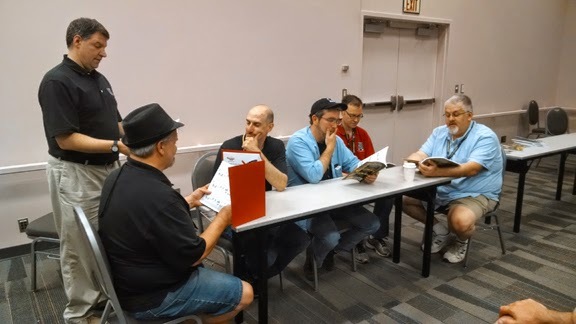 1st Edition AD&D game being run, but I knew there were many. Unless you had the pre-program Excel sheet you were just SOL for finding games. Of the six games I wanted to play I was able to register for two. One wasn't run and the other I couldn't attend because a game I did get in with generics went long. Now I could have tried to get into more games, but standing in line at registration was a PITA and I figured if I wanted to there would be openings I could get in with generics. I basically chose to take it easy at this con and not try to cram as much gaming as I could in. After years of organizing and then running two (or more) events a day and spending free time volunteering at a dealer booth.....this was a refreshing change of pace. There were a couple of notable changes this year for the con. Quite noticeable was the lack of swag bags. I'm sure a lot of folks missed them, but I for one welcomed the change to coupon books. Now I did think many of the coupons in the book were lame, but I liked the idea that attendees had to actually visit the various booths to get anything. The Mayfair Bob & Angus pin made you go to the Board Game room, for example. If you wanted the item from Steve Jackson Games you had to visit the Munchkin Tavern in a hotel across the street from the Convention Food Court. Stuff from swag bags wasn't being discarded all over the convention because people didn't want it. I had a couple of other great purchases, one of which I will probably review Friday. 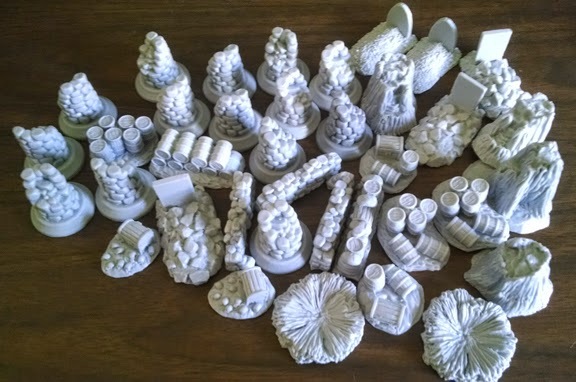 I bought a bunch of small resin terrain pieces from Acheson Creations. There was one particular small piece I was looking for and he got one in during the con, but was good enough to hold it for me, which was a surprise. I already have a few previous pieces primed and will have to get these ready for a good old-fashioned painting party. I love using these as accent pieces with other terrain bits. One of my evening events was an unexpected Knights of the Dinner Table Meet & Greet and Live Reading. I'll come right out and say it.....these have been getting a little long in the tooth. A couple years ago the D-Team (D for Development) stated they were going to take a break from doing these because the same people have pretty much attended almost all of them, which kind of took the edge off. I don't think they actually had planned on doing one this year because they didn't bring their Live Reading books (pre-marked for each character/story) and additional swag to give out to participants. The event was listed in the event book, at a $4 price no less, and they sold a couple of tickets. I read once and it was good enough for me. Nobody really has any questions for the Q&A of the Meet & Greet and I think most everyone involved was there because they could be. I think two people were really eager, possibly their first time, and it was cool that KenzerCo went out of their way to accommodate those two when they could just be drinking together and slinging some dice. Sunday came way too fast. One of the highlights of the day was punching DM Nick, from the Roll For Initiative Podcast, in the face. Granted, it barely registers as a punch, but technically it was a punch to the face and...this is the important part, I was the first person at the con to do so. DM Vince from the RFI podcast offered some reward to the first person who punched Nick in the face. I don't remember the award, but it was significant enough I remembered to punch Nick. I WANT MY PRIZE VINCE!!!!! The bigger highlight was just doing a random walk around the dealer hall and looking at some of the artist's booths. There was some great art. Some of it was good, just not my style, and some was good but out of my price range. Honestly, if I don't have the cash to buy some art I don't usually spend too much time browsing. I'm not much of a looky-loo. One artist booth completely caught my eye. CitricART (Tumbler and Twitter feeds) AKA Tina Bongorno, had a little sign that said something to the effect of "50¢ Commissioned pieces drawn in 60 seconds." I think her only real rule was no references. This completely intrigued me. For fifty-cents I didn't even care if I liked the art...this I just had to see. 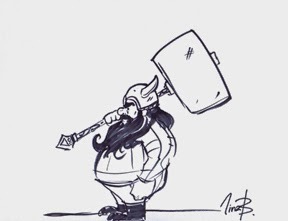 All I asked for was a Dwarf with a big Warhammer. She took closer to two minutes to sketch this out and I was enthralled to the point that the hair stood up on the back of my neck. The ability to conceive of a picture and execute so quickly just...wow. We ended up going back and buying some prints and she had some great prices for commissioned work...something I hope to take advantage of later. Alas, all cons must come to an end. 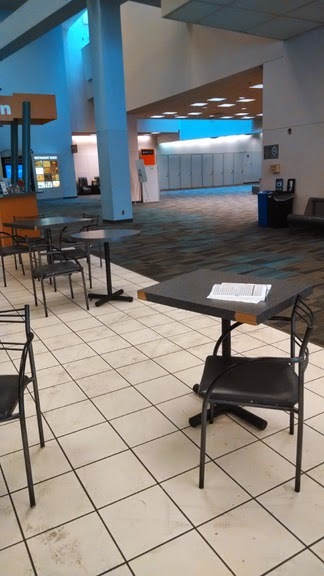 The Mrs. and I got back into the convention center Monday and it was eerily vacant. At first the only sign that Origins had even taken place was this lonely event book left on a table in the small food court outside the Board Game hall. 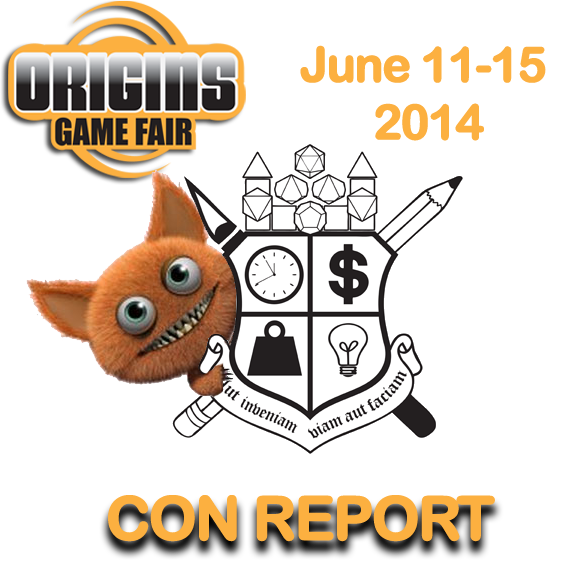 Even though it was quite a slow convention for me I really enjoyed Origins this year.